777 Bison Ranch Foreman, Justin Selke, watches as a helicopter scans the prairie for mule deer. 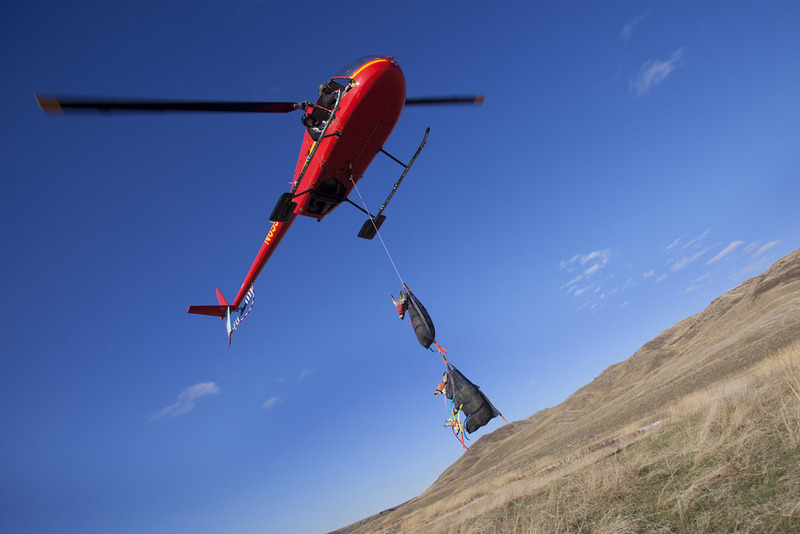 A helicopter piloted by Blake Malo, of Kiwi Air, hovers over the ground and slowly lowers two sedated mule deer to be inspected. Wildlife biologists Matt Gottlob, left, and Kevin Robling, run to the sedated deer to begin the time-sensitive research process. The ground team works quickly to take blood samples, apply radio collars, pregnancy check, and administer antibiotics to the sedated deer. The ground team carries a blindfolded, sedated deer, out to a clearing to be released. A mule deer fitted with a new radio collar makes her way across the prairie.